The holidays are officially over, but that doesn’t mean the good times have to end! Beat the winter blues by booking a weekend trip with your best buddies and head to Montreal – Canada’s second-largest city that never sleeps! It may be chilly during the winter months but there are many fun and exhilarating activities that get the blood flowing. Here are the top five reasons to visit the city during the next few months. Montreal has come up with an original festival to combat those winter blues and it’s called Montréal en Lumière. What began as a small project 20 years ago has quickly evolved into a month-long celebration that involves outdoor events, street art, and gourmet dining! For all the details, we recommend heading to their website and remember the festival takes place from February 1st until March 3rd. Do you know any other city in the world that hosts an all-night art party in the middle of winter? 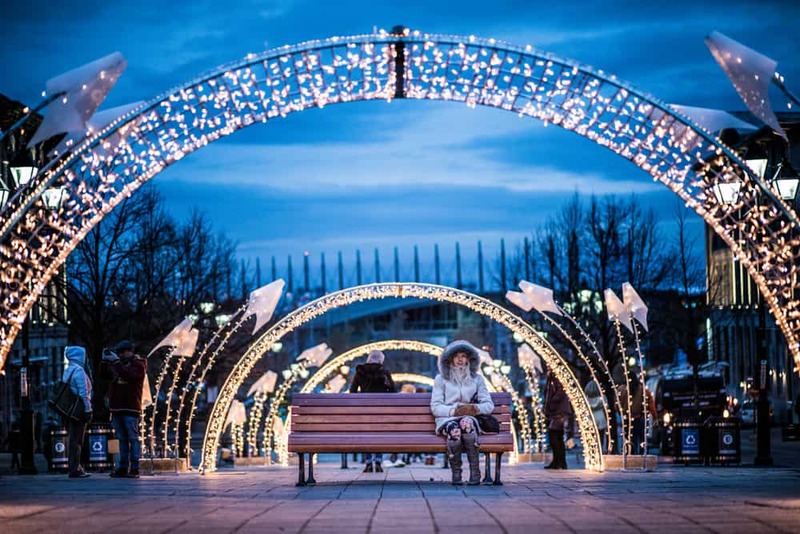 Every year, Montreal hosts an event called Nuit Blanche, which roughly translates to “white night” in English, and involves hundreds of public art exhibitions, parties, and eclectic raves. The metro is also open throughout the evening, so locals tend to go wild! Last year, nearly 300,000 people participated in the event, and this year, Nuit Blanche’s popularity is expected to grow! For more information, head to their website and get ready for the festivities to begin on the evening of March 2nd! If you’re a fan of EDM, snowsuits, and numerous ice bars in the heart of the Old Port of Montreal, then you’re going to love Igloofest, which takes place from January 17th until February 2nd. This year marks the 13th edition of the outdoor rave, and the organizers have booked some big DJs including Diplo, Above & Beyond, and Spencer Brown. We recommend applying several layers before heading out the door and make sure to pre-drink at the hotel beforehand – as the drinks are expensive at the venue. After all of these outdoor events, you’ll want to warm up with the help of a gorgeous goddess at Le Penthouse. After a wild night on the town, book an appointment with your buddies and get ready to experience intangible pleasure throughout your entire body. Our masseuses have years of experience in this tantalizing art, and they can induce euphoria that can last for hours. In addition, we also provide an exclusive VIP treatment that includes a whirlpool tub and a large shower for some extra fun. If you prefer a four-handed massage or something a little more scandalous that involves stockings, just call ahead of time and let us know. If you’re thinking about booking an appointment at Le Penthouse, visit our website or call (514) 564-3332 for more information.